When you think of the Mark Hamill Joker, it's easy to recall his iconic turn in Batman: The Animated Series and the DCAU. But video game fans might remember it instead from his appearance in the Batman: Arkham games — which is now the subject of this stunning Sideshow statue. 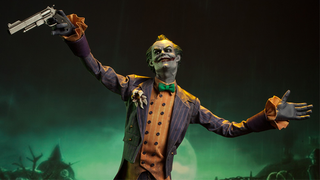 Based on his appearance in the first game in the series, Arkham Asylum, the statue — err, *ahem* "Premium Format Figure", which is Sideshow's fancy way of saying it's an unarticulated statue wearing cloth clothes — certainly capture's the Joker quite well, especially the game's aesthetic of blending the gaudy comic book colours in a more "realistic" setting. The cltothes themselves almost stand out more than the Joker itself: They're immaculately detailed, and tailored just right. There's always a problem with statues and figures this scale that real material can look far too bulky, but here it works splendidly. Brilliant, but kind of ruined when you realise that you just have to imagine Mark Hamill's trademark cackling in your head. This thing should totally have a button to press that just plays voice clips of the Hamill Joker. You can't really have one without the other! If you want the statue for yourself, it'll be available from Sideshow starting from tomorrow, ahead of release later this year. It'll set you back a rather eye-watering $450 for your troubles.